How can I setup a photo slideshow as the Off Air content for my channel? 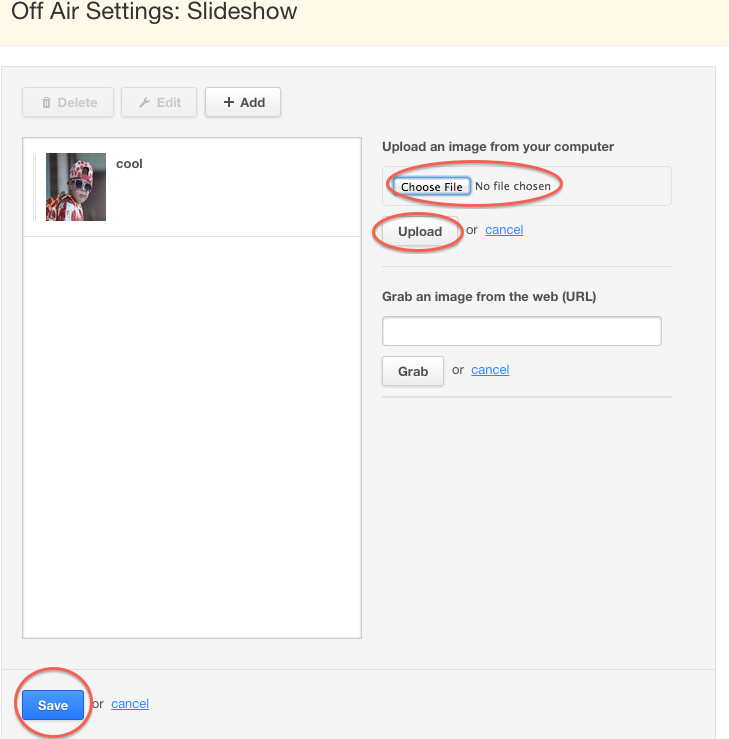 You can now add a slideshow to display as your Off Air Content. Viewers will see this if they go to your channel and you are not broadcasting. It is best to upload JPG images that conform to the 16:9 aspect ratio so they will fill the entire player window. 640 X 360 or 1280 X 720 sized images work well. If you cannot resize/crop the image to these dimensions you will see black bars on the sides. Images should be under 1 MB in size. In the upper right corner under your username select "Dashboard." Under Channel select "Off Air." Select the "Show slideshow" radio button and then select "Edit Slideshow." Click on "Choose File" and locate the image you want to upload. Pick a name for your image. You will then see a banner on the top of the page confirming that the images will be visible within 10 minutes. You can also select an image from the Web and paste the URL in the box. If you want to change the order of the slide show you can drag the images up or down. How do I set up SSO using Google Apps with Ustream Align?